The second piece in Recycled Minds' Voices of Occupy series is written by Cyrus Kleege, who has been participating in and following the critical narrative of Occupy Wall Street. Kleege's article is a response to George Lakoff's article, "Framing Occupy Wall Street," published last week on Truthout, in which Lakoff argues for a moral framework for the Occupy movement. Kleege is a professional book clerk, amateur writer and activist living in Brooklyn. You can read more of his writings at Occasional Vitriol and Rich Jerk Quote of the Week. I have been increasingly interested and involved in the Occupy Wall Street movement that sprung up in New York about a month ago and in a short time began to spread to the far corners of the United States and the world. I haven't been able to properly “Occupy” Zucotti Park as I work full time, but I have made it to most of the larger actions: the march halfway across the Brooklyn bridge (followed by the paddy wagon ride to One Police Plaza), the huge labor solidarity march the following week and the convergence on Times Square this past weekend. It seems that the usual dismissive criticisms and back-handed compliments from supposed allies have failed to overshadow tangible victories, like the one that occurred last Friday when thousands converged in the dawn hours to prevent the police from emptying the park. With each victory the movement draws more sympathizers into the fold, but simultaneously rankles the very powerful interests and institutions that are threatened by this type of nascent mass-movement. When I saw a piece by George Lakoff in Truthout this week, billed as his advice to Occupy Wall Street on how to present itself to the world at large, I was interested. I was familiar with his thoughts about how political ideas exist within cognitive frames. He describes how the political worldviews of most individuals are not based on rational inquiry but on an emotional response based on a cognitive framework. The framework is a set of arbitrary moral judgments. Lakoff's work in this field has always seemed generally valid to me. The left sees individuals as irrevocably part of a larger society. The right sees the individual as autonomous and ultimately responsible for his own actions. The left sees a need for nurturing and collective decision making, while the right looks only for the individual's right to act freely, responsibly and in self-interest. In identifying these important root differences in point of view I feel that Lakoff has been particularly astute. I've always been frustrated by the fact that no amount of economic statistics on income inequality or social mobility can cut through the typical conservative's ironclad belief that it is the individual's personal responsibility to find work, to the extent that if there were five jobs available to the twenty six million un- and underemployed in America, it would be the individual's responsibility to be one of the five most educated, hard-working and diligent applicants, and if they weren't, there would be no right to complain or petition government to help them in their situation. Lakoff in his short essay proposes to have some insight into how we can circumvent the conservative framework and become a more truly mass-movement. In my opinion though, he seems to ignore the basis of his own ideas when formulating his advice. Lakoff goes on to claim that what the Occupy movement needs to do in order to win hearts and minds is to cram its own goals and principles into a superficially conservative framework and then expect conservatives to be bamboozled into agreeing. It seems to me that this is doomed to failure and shouldn't be seriously considered by anyone involved. He claims that Occupy Wall street should declare itself a “moral” movement and go on to explain to its detractors that it is society's moral duty to nurture the individual. He himself, however, has already clearly explained why this is next to impossible. A conservative's morality is based on a framework where free-will decisions are either punished with destitution or rewarded with wealth. For the society to “nurture” the individual in hope of insuring her success is doomed to failure and at any rate, rife with moral hazard. I would like to propose a different tack in trying to reach out to those who don't already agree with the general left-leaning point of view of the Occupy Wall Street movement. Simply by coming into existence, Occupy Wall Street has begun to challenge the overall conservative ideological framework, not by attempting to work within it, but by loudly and clearly presenting the opposite framework. It has shown with the thousands who have shown up at Liberty Square and marched and rallied for more specific causes (Labor rights, a legally-enforced living wage, foreclosure relief and affordable housing, environmental concerns about hydro-fracking and the nuclear industry) that the conservative framework's deficiencies left-unchallenged have produced suffering in the 99% that will no longer be met with apathy. It has always seemed to me not that the vast majority of Americans are conservative in their world view, but that those who are are louder, more consistent and supported by most of the powerful institutions of the media. Now, with the Internet technology as a world-straddling megaphone and multiple physical spaces delineated as breeding grounds for activism, consciousness-raising and civil disobedience, our side just might have the power to push back and win a significant number of converts. I fear that following Mr. Lakoff's advice would simply dampen this energy and if anything, reinforce conservative's belief that their framework is so superior to ours that we must adopt it even as we try to fight it. Labels: activism, guest contributor, Occupy, U.S. I see your point about Lakoff's piece - but where does morality fit in then? Is, or better, should, morality have a place in this new movement towards structural change? Thanks for your comment. I wasn't trying to say that the OWS side of this should try to be amoral or immoral, just that we should advocate for a morality based on our broader left-leaning "cognitive frame" That society taking care of the weakest (rather than calling them lazy) IS moral. Also, I think it better to use words like 'ethical' and 'just' rather than 'moral' as it has a more absolutist and arbitrary connotation, while the previous two can be based on a practical, humanist worldview. 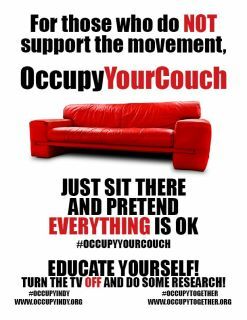 Cyrus - your comment is starting to get at how Occupy in general may need to address some of the non-supporters' claims. Taking an ethical stance against the current corporate/capitalist paradigm needs to address the us-vs-them mentality, and perhaps promote an "us" mentality. We are all in this together. All of us. It would seem that we will need to move forward together. Is that possible? ha! I am immediately suspicious of any argument that is based around morality -- like you say, ethical or just would be better, and safer, terms. And I also agree with the author's reading of Lakoff's article. Using the same linguistic play that conservatives use to twist "morality" into politics would be dangerous and self-defeating to the Occupy protests.